Whether Russia did or whether it did not, meddling in US elections is not Russia’s greatest crime. Bombing civilians in Syria is Russia’s greatest crime & when you scratch beneath the surface of all this gloating over the conclusions of the Mueller investigation it’s all about defense of Russia’s military intervention in Syria to defend the Assad dictatorship. It’s a curious thing, this preoccupation among libertarians about the bum rap Putin & Russia are allegedly getting from liberals. Paul Craig Roberts thinks “Russiaphobia Is out of control.” But then he’s also a white supremacist who thinks white people are victims of racism, hatred & discrimination. He’s a person of no intellectual consequence except that Assad supporters consider him a guru. Glenn Greenwald, the libertarian expert on everything in the universe & a regular on Fox News, also is concerned by baseless allegations against Russia. 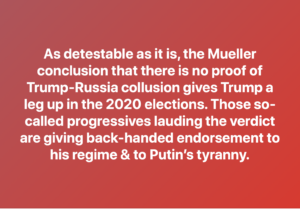 It does look like the Mueller investigation is politically off-base because meddling in US elections is not Russia’s greatest crime. Bombing civilians in Syria is Russia’s greatest crime & when you scratch beneath the surface what this rubbish is all about is defense of Russia’s military intervention in Syria to defend the Assad dictatorship. When we evaluate politics & try to understand what is going on in Syria & elsewhere, the simple measure is: those who are bombing civilians are war criminals; those being bombed by Russia, Syria, & the US coalition are civilians, not “head-chopping jihadis”; & those rescuing those being bombed are freedom fighters. 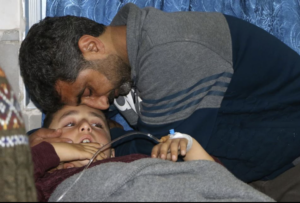 Photo is a father in Afrin, Syria with his small son who was injured by Syrian & Russian bombing. End the bombing of civilians in Syria. All foreign military forces out now. Matt Taibbi & Glenn Greenwald, now justifiably a favorite on Fox News & also on Democracy Now, both claim the Mueller investigation of Trump-Russia collusion was a greater travesty of justice than the Bush administration’s claim of WMDs in Iraq. A conservative estimate of deaths in that war is nearly 500,000 & the occupation rages on, including Mosul. Greenwald is fundamentally a conservative thinker who pompously utters more nonsense than any commentator should be allowed. Those who cite him as an authority need to have their heads examined. There is probably no single media source that has done more damage to feminism than the NY Times since the emergence of the women’s movement in the 1960s. The most egregious misrepresentations are of the movement as man-hating spinsters & lesbians, middle-class & white professionals. The characterization of the movement as middle-class white women only rings true of the celebrity (as opposed to activist) leadership of the movement, most of whom were associated with the Democratic Party. It was massively deplorable when women from leading feminist groups like the National Organization for Women, Equality Now, & Feminist Majority Foundation (publishers of Ms. Magazine) led the campaign in support of the US-NATO war in Afghanistan under the guise of liberating women from the Taliban. ‘Liberating’ by bombing the country to smithereens? Such prominent feminists as Gloria Steinem, Meryl Streep, Jane Fonda, Dolores Huerta, Lilly Tomlin, Eleanor Smeal made public statements & videos & signed ads in major media calling for the US military to ‘liberate’ Afghan women with bombs. There was never a more detestable capitulation to the Muslim-hating ‘war on terror’ nor a greater betrayal of feminist principles than their war mongering represented. Now Susan Chira, a senior staff writer for the NY Times with questionable politics, has resurrected that history as if it were not an ignominious chapter in American feminist history. In a March 22, 2019 article titled “Women Here are Very, Very Worried,” she actually dares enumerate social gains for Afghan women as a result of the nearly 18-year war. Color her shameless since her source is the war mongering Feminist Majority Foundation. According to them, “In the 17 years since the invasion, education for girls has spread; today they make up about 40 percent of the country’s elementary school students & about 35 percent of its middle & high school students…. Women now make up nearly a third of civil servants…& have been encouraged to become police officers & judges. And a network of women’s shelters has been established across the country.” What Chira neglects to mention is the MOAB bomber in the room: that so-called liberation of Afghan women has involved the bombing deaths of thousands of Afghan men, women, & children; the destruction of fields, homes, schools, mosques, hospitals; the disabling of thousands from landmine explosions; widespread child labor; massive displacement to refugee camps & other countries; monstrous war crimes against civilians & prisoners, including torture of detainees in CIA prisons. To back her argument that the war has served Afghan women, she quotes a couple Afghan feminists more concerned about the Taliban than about US bombing. There’s a lot of rubbish written about so-called white or western feminism. The correct terminology is pro-war, rightwing feminism which has nothing to do with ethnicity. War mongering feminism puts the interests of class & US dominance in the world over that of women & children. These feminists do not speak for the majority of feminists in the US & around the world. 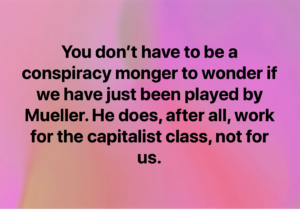 They speak for the ruling elite since feminist contingents in antiwar protests were common until the movement was debased by capitulating to the Muslim-hating ‘war on terror’. This photo of Gloria Steinem with former US Secretary of State Madeleine Albright at a 2016 Hillary Clinton rally says all you have to know about war mongering feminism. It apparently gave war monger Steinem no discomfort to stand with Albright, not just a war monger but a war criminal who said the deaths of 500,000 Iraqi children were ‘worth it’ to achieve US policy goals in Iraq. If feminism does not stand against war, it stands for nothing. In December 2018 when Trump announced the withdrawal of 7,000 US troops from Afghanistan, he wasn’t announcing the end of the war although it was widely interpreted as such. There are still over 7,000 US troops & probably triple that in special forces, mercenaries, & CIA operatives, plus 8,473 troops from 38 other countries. The US Air Force, which remains in Afghanistan, reported that it dropped more bombs & other munitions in the country in the first ten months of 2018 than in any other year since the occupation began in 2001. From January through October 2018, US forces dropped 5,982 bombs out of the 6,600 sorties it flew. Casualties from airstrikes have increased every year since 2014. So although the US may be withdrawing some of its ground soldiers, it is escalating the barbarous air war against the Afghan people. The intensified bombing, of course, has caused a record number of civilian casualties. According to data from the UN, there were 3,804 civilian deaths in 2018, including 927 children. Women & children together represented 38-percent of all civilian casualties. Yesterday it was reported that a US bombing near Kunduz killed 14 civilians, ten of whom were children. The US Pentagon is blaming their deaths on the Taliban saying, “The Taliban were hiding in civilian homes & maneuvered in & out of compounds without any concern for the families living inside.” What the Pentagon spokesperson is admitting is that the US bombed Afghan homes & villages knowing there were civilians present in order to pick off some Taliban fighters. That is called a war crime. The international antiwar movement must be rebuilt to stand steadfast against the war on Afghanistan with the demand of ‘US out of Afghanistan’. 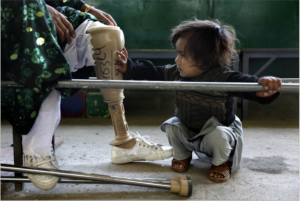 This photo is an Afghan girl touching her mother’s artificial leg which was lost in one of the thousands of landmine incidents. While insisting that the relocation to an uninhabitable island should be voluntary for Rohingya refugees, the UN food aid agency World Food Programme has drawn up a plan for the Bangladeshi government that would “facilitate” the deportation of 103,000 refugees. What about the Rohingya chorus of ‘hell no, we won’t go’ does the UN not understand? So while some commentators are drooling about the “multidimensional restorative potential” of Jacinda Ardern’s “kind of love,” other commentators are questioning why she is noncommittal about whether she will raise the issue of China’s genocide against Uyghur Muslims on her upcoming state visit to China. Will she be guided by that restorative love or by realpolitik? 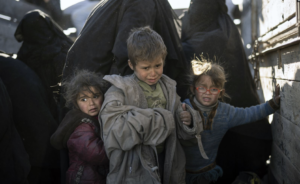 These children are among the estimated 10,000 fleeing US-coalition carpet bombing in the Baghouz district of Syria under the guise of destroying ISIS which controls the area. Much of media describes them as children of ISIS fighters but in fact most of their families have no association whatsoever with ISIS but lived forcibly under their control. Whoever their parents, children have absolutely no culpability for the politics of their parents & are victims of war. Demand the immediate cessation of Syrian, Russian, & US-coalition bombing & the immediate, unconditional withdrawal of all foreign military forces from Syria.